BBL, an authorized distributor of US Steel standard and line pipe, carries a wide selection of carbon steel welded pipe and tubing from 1/8″ to 24″ in diameter and seamless material up to 24″ in diameter. BBL also provides carbon alloy, stainless steel, nickel, nickel alloy, and aluminum pipe/tubing. It has served its regional marketplace for over forty years. Ameridan was engaged by BBL’s owner to conduct a targeted, confidential sale process. Ameridan’s work included: (1) assessing, structuring and presenting confidential Company information; (2) identification and contacting of potential acquirers; (3) assisting management in developing and presenting appropriate business plans and financial forecasts; and (4) advising BBL’s ownership on various transaction proposals received. 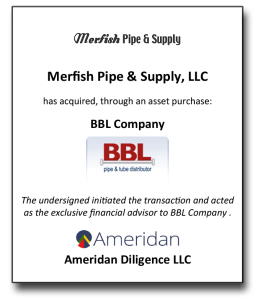 The engagement was successfully completed On July 31, 2013, when Merfish Pipe & Supply LLC acquired substantially all of the assets of BBL Company. Merfish Pipe & Supply LLC is a master distributor of carbon steel pipe, fittings and flanges. It is majority owned by One Equity Partners, the private equity arm of JPMorgan Chase & Co.
General line service center offering bar products, flat roll steel, plate, structurals and other steel products.